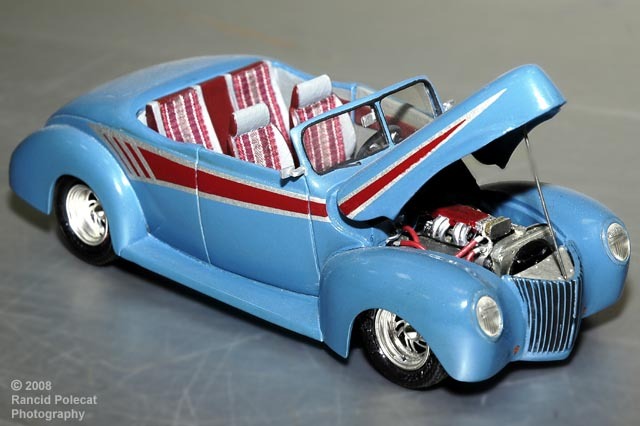 Lyle's model reflects the trends that were popular in the full-size hot rodding world in the late 1980's -- machined billet wheels and mirrors, bold graphics, pastel colors, flush mounted lights, digital electronics, and a reliable fuel-injected factory power plant. The graphics are homemade decals. Remeber this was before people in our hobby discovered ALPS printers and photoshop. Lyle hand painted the graphics on clear decal sheet, then applied them to the car.